It’s Good To Read: Cruelty-Free Kitty! She has amazing advice on all things beauty AND cruelty-free! + Every year she posts an extensive cruelty-free cosmetics reference list! Makeup, Skin/Body, Hair & Nails. She has some a-m-a-z-i-n-g advice on starting a blog! I mean GREAT. Stuff I wish I had known a year ago…& even just a week ago! Regarding #1 above, I mean she literally goes above and beyond. Suzi is a TOP resource for cruelty-free products AS WELL AS cruelty-free, like-minded bloggers (all about sharing the love and creating awareness). 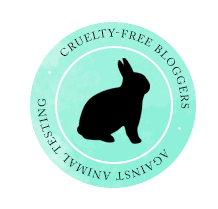 She even created this symbol for cruelty-free bloggers to place on their sidebar(like we did!) as a means for promoting other conscious websites (when you click on the bunny, Suzi’s list of 100+ cruelty-free bloggers appears). 100 Cruelty-Free Bloggers Everyone Should Follow! How I Monetize My Blog and How You Can Too! Cruelty-free kitty is now on my list of go-to favorites. The blog is fun, inspiring + informative. But best of all, it’s ethically motivated! That’s everything we care about here. You want to change the world? Look at what you vote for (support) though your purchases! PS: Regarding that miceller water, I’m still on the hunt… I may ask the queen of Hunt Beautiful (Elena) to join me on this quest for the world’s most perfect cleansing water. It may be a homemade formula. Details to follow. Stay tuned Goodsters! 0 comments to "It’s Good To Read: Cruelty-Free Kitty!"